Burning Bright, by Tracy Chevalier, is the book I’m currently listening to as I knit. Chevalier’s historical novels involve ordinary characters who’s lives entwine with that of a famous creative individual, in this case, poet and artist William Blake. At the center of this book is the Kellaway family, and one of the points of interest that snagged by curiosity is the “Dorset buttons” that Mrs. Kellaway and her daughter Maisie make with rings and colorful thread. A search on the WWW has turned up lots of information about this once flourishing cottage industry. Dorset householders had made buttons for generations, using tiny disks of sheep horn as the button foundation. During the early 1700’s, the introduction of metal rings, which were cheaper and quicker to use, transformed the custom into a small industry. In 1731, Blandford draper Robert Fisher opened a button “depot” at his shop, providing the cottagers with a central place to market their buttons, and other businessmen who needed buttons for their products could buy them in bulk. The buttons were sold at between eight-pence and three shillings a dozen, while the women workers averaged about two shillings a day for making six or seven dozen buttons. This seems grossly unfair today, but the only income generating alternative for these women was the more rigorous work of farm hands. There were other advantages to becoming a button maker. The women could work at home while tending to the needs of their families, and weather was not a factor as they could work indoors. Wear and tear on clothing and shoes, and less physical fatigue, were other factors. The cottage industry thrived until the introduction of a commercial button making machine in 1851. Fortunately, there are still a few Dorset button makers among us, and some of them have posted good tutorials. Here’s one of them with some good photos. Inspired by visits to New York’s Cloisters museum, when I came across a copy of Candace Bahouth’s Medieval Needlepoint pattern book, I had to buy it. Now out of print, this fantastic resource can be purchased used at online booksellers’ websites. Pictured here is my first finished project, a magical, stately unicorn, who is now gracing a velveteen pillow in my home. It was a joy to stitch and makes me smile each time I see it. 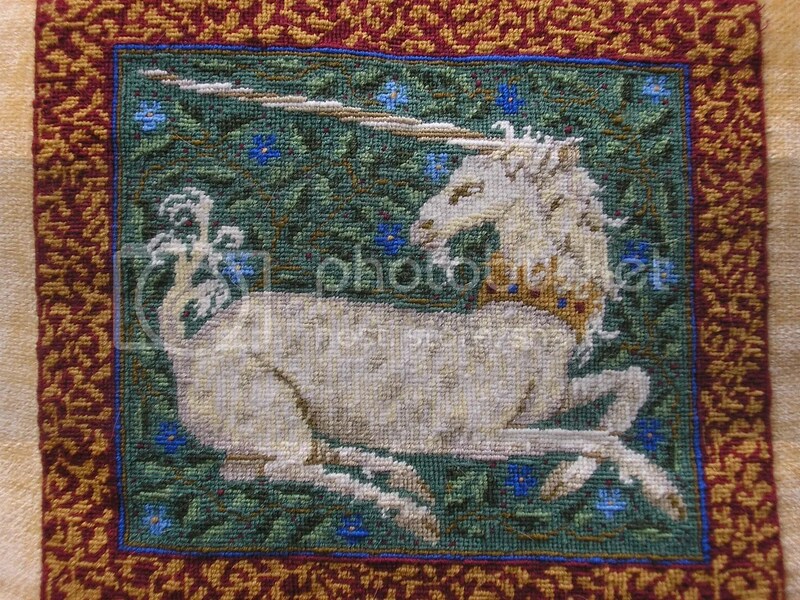 The Cloisters has a series of world famous unicorn tapestries in a specially designed, oval room at the museum. Well worth visiting, it’s an enchanting place if you enjoy medieval art and life. One More Skein is divided into four sections, containing patterns for adult hats, gloves and scarves, some unusual garments for babies, a collection of bags, and household items. Each project requires a couple of skeins of yarn, with the exception of the blanket pattern, which would be great for using up leftover yarns in different colors. My personal favorite is the linen placemat pattern. The appendix includes instructions for specific knitting techniques and a list of suppliers. While author Leigh Radford has introduced some original design elements, as a lifelong knitter, I find this collection a bit too basic. On the other hand, it would probably be of great interest to beginners or those looking for some quick, easy, and attractive gifts. Beautifully photographed by John Mulligan. Knitting News: Knit Your Own Royal Wedding! Your invitation to Westminster hasn’t arrived yet? Not to worry. Even if you’re not a guest, you can join Will and Kate in spirit, by staging your own private wedding in your own home. This newly released book by Fiona Goble contains patterns for bride, groom, family, guards, even a romantic balcony scene, complete with the royal Corgis. In her introduction to Knitting America, author Susan Strawn quotes one of her predecessors, Richard Rutt, in bemoaning the fact that very little information is available concerning the earliest history of knitting in America. Strawn’s book does little to expand the historical record, but it is a fun overview of nearly four centuries of this not-so ancient craft (compared to weaving, for instance). The section on the first American knitters spans a mere 21 pages, and much of that space is taken up by photos. The picture Thomas Jefferson’s monogrammed slippers shows one of the few extant pieces actually made in the colonies, while most of the others came from Europe. An anecdote from the writing Susan Rowlandson, who was abducted by Indians, tells how she carried and worked upon her knitting during her captivity. Once the narrative moves into the Victorian period, both factual information and historic examples abound. and by the turn of the twentieth century, readers are treated to a wealth of interesting material. Perhaps the book’s greatest contribution is in its wealth of documented photos of ads, magazines, patterns, and the social aspects of knitting. Also included are 20 historical patterns adapted to modern terminology and materials. Not a book to be read straight through from cover to cover, but to be browsed and enjoyed for its celebration of knitting. Scotland’s Arran Knitting Company is offering a free guide to teachers to show how traditional knitting skills can be introduced to the next generation. Textile artist Lynn Gray Ross said, “I am providing a worldwide on-line resource for teachers of all ages and stages, based on my own experience and my work with primary and secondary teachers over 30 years, including development of the award winning learning programme “Connecting Threads”. Knitting is portable and inexpensive. Teachers around the world are discovering that, among students of various ages, it promotes calmness and attention as well as mathematical-logical , visual-spatial, bodily-kinesthetic, and interpersonal skills. To order the guide in pdf form: simply log on to http://patterns.on-arran.com/page/Contact+Us and send a request for the Guide to Knitting in the Scottish Curriculum for Excellence.